Travel through Oban, looking for the signs for Lochgilphead A816. After leaving Oban, stay on the A816 for approximately 8 miles until you see the turning marked Easdale B8449 and the brown Seafari signs. Stay on the B8449 (approx 8 miles), cross the bridge over the Atlantic. You still have 4 miles to reach Easdale. You will pass through a small village called Balvicar - Keep on the main road which swings right and over the hill and drops into Easdale. Sat Nav postcode PA34 4RQ will take you right down to the harbour. On arrival at Easdale we request that you park your vehicle in the FREE VISITORS CAR PARK. It is to the right of the harbour as you enter the village where there is ample space for all - it is signposted, you have to drive in front of a row of houses and then turn right into the car park - you will feel like you are driving to a dead-end but don't worry, there is a car park around the corner ! We ask our passengers not to park their cars to the left of the harbour, near the jetty and the Seafari trailer, as this area is used by the residents of Easdale Island. We can be reached by the public bus no.418 from Oban - this may be shown as 418 or 018 on the front of the bus - if in doubt, please ask the driver ! This bus departs from outside the Bank of Scotland opposite the Train Station in Oban and comes directly to Ellenabeich harbour square where we are based - the timetable can be found here. 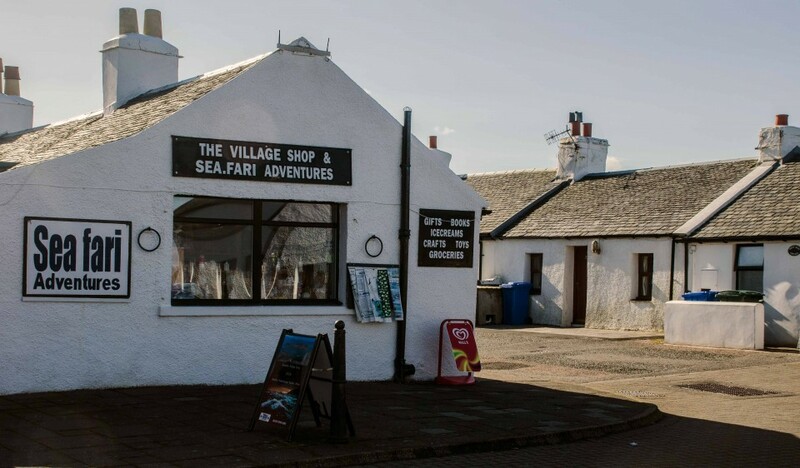 Our ticket office is based in Easdale Village Shop - located on the harbour square in Ellenabeich. Once you arrive for your trip please come and see us in the shop and we will have your ticket ready for you.